← Best Au Gratin Scalloped Potatoes – and they’re gluten free too! TIP: Really you can use almost any kind of gluten free cracker, chip-type food, and/or plain cereal. Our mix usually changes from year to year! In two large roasters, mix together the crackers, cereal, pretzels, and peanuts. In a small pot over low heat, melt the butter and add the seasoning salt, garlic salt, Worcestershire sauce, soy sauce, cayenne pepper, lemon juice and tobasco. Now drizzle a quarter cup or so of the butter mixture over each of the roasters and stir them well. Repeat until you are out of butter mixture. Bake in 250 degree oven for 1 ½ to 2 hours, stirring every 30 minutes. They are done when they smell slightly toasted and no longer look buttery. Cool and store in air tight containers for up to three weeks. Can also be kept in the freezer for longer. 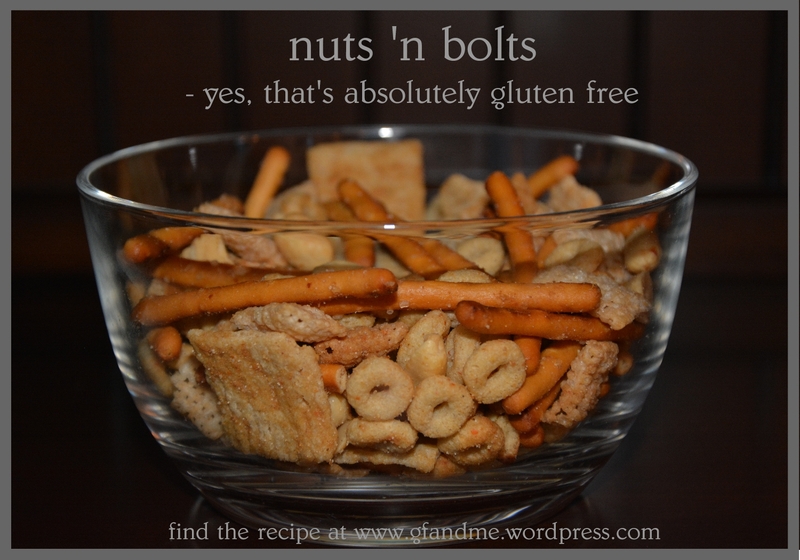 This entry was posted in Lunch and Dinner, Recipes and tagged candy, celiac, Christmas, GF, gluten free, rice chex, vegetarian. Bookmark the permalink. Great snack! I always found snack food was the hardest to find, especially when I went GF 14 years ago. I also came up with my own GF Chex mix, but course that was before Chex were GF and I had to substitute. Snacking is much easier these days. Yes, I’m sure it is. We still find it one of the harder things though – that and quick lunches! They sure do look yummy. Can’t wait till Christmas. I think you could have some before then! Never heard it called “Trash” before! Funny, that was one of Geoff’s first thought too. Luckily we had pretty much a whole year to come up with the ingredients list! My favorite bits are the peanuts, pretzels, and brown rice crackers. Geoff likes the glutino crackers. And how sweet is that of your mom! Reblogged this on The Gluten Monster. I love nuts and blots. It reminds me of family Christmas when I was a kid. Us too. The original recipe for these came from Geoff’s uncle who used to make them every Christmas. My neighbours growing up had a huge Christmas Party with mountains of food. Cream puffs, candy, nuts and bolts. More things than I can remember. I do remember the Mandarin oranges. It was an amazing celebration complete with a visit from Santa Claus who gave everyone a candy cane.